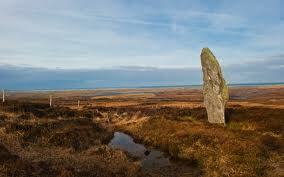 When at Howmore there is a distinctive standing stone to visit at An Carra, just off the A865 north of Kildonan. It is 17′ high, almost 5′ wide and has a depth of 2′. Full details are to be found on the Britain Express website and here there is an interesting warning. 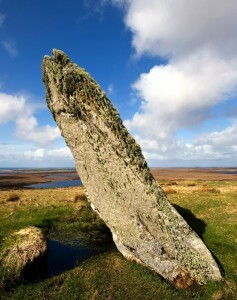 Another stone with the same name on the side of a slope also called Beinn a Charra is to be located in North Uist. To avoid confusion this stone is referred to a Beinn a Charra. The photograph of the latter is by James Smith whose gallery of Hebridean images is well worth visiting and which opens with a fine black-and-white shot of the Callanish Stones, Isle of Lewis, on a winter’s day. Here we are very much in standing stone territory.